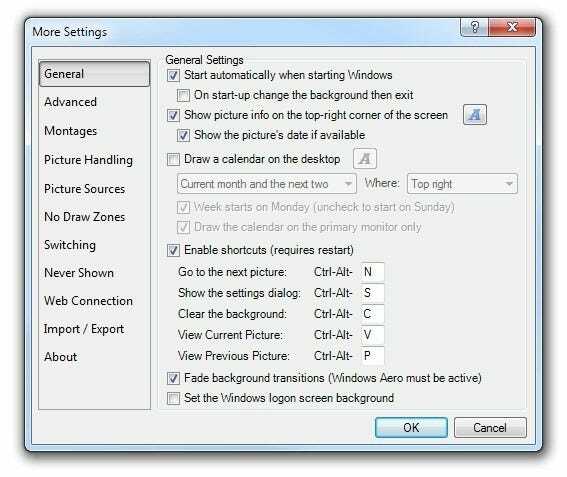 If you’re looking for a free but powerful solution to automate your Windows wallpaper switching, read on as we show you how to pull fresh wallpaper from your computer, wallpaper web sites, RSS feeds, and custom image searches. A free copy of John’s Background Switcher. If you already have a folder of wallpaper images, that’s great. If not, don’t worry! You’ll find JBS will pull wallpaper from so many sources you’ll be flush with new and interesting images. First, run the installer. Once installed, launch the application. You’ll be greeted with the screen see in the screenshot above. While you can hardly go wrong with great image sources like the top 250 images on Flickr or the new content from the highly regarded Vladstudio, it’s a bit cookie cutter for our taste. The whole point of this tutorial, after all, is to enjoy wallpaper customized and tailored to your tastes. When you’re setting up image search strings, be they for Google, Bing, or Yahoo!, we’d suggest hitting up the actual search engine to see if the terms you’re using yield the results you want. 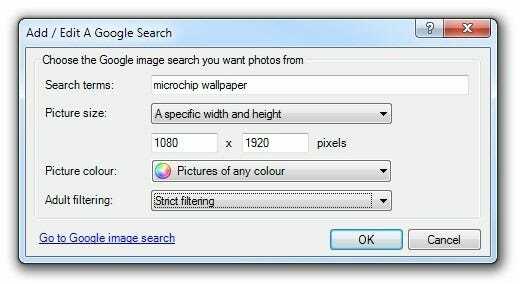 In our case, searching for large images of microchips yielded a lot of bland diagrams and generic digital photos, tacking on “wallpaper” greatly enhanced the results. One of the greatest, and potentially most under used features in JBS, however, is the ability to pull images from RSS feeds. This opens up a whole world of content that isn’t normally accessible to a wallpaper application. Let’s say, for example, you like a particular artist or category on the web site DeviantArt. You can easily turn their galleries into an RSS feed to fuel your wallpaper addiction. Let’s do that now to demonstrate how easily it can be done. You’ll see that logo all throughout DeviantArt, clicking on it gives you an RSS link that, normally, you’d plug into an RSS reader. 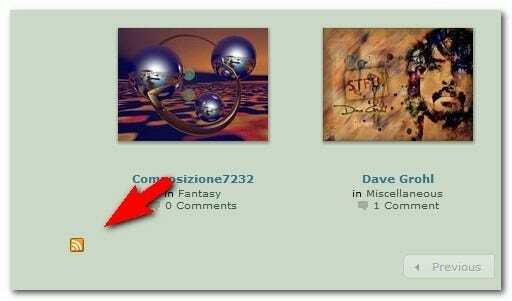 In our case the RSS reader is JBS, which will in turn pull images from DeviantArt. Since having all the wallpaper on DeviantArt would be a bit overwhelming, we’re going to drill down to Abstract category and snag the RSS link from there. Simply right-click on the RSS icon and copy the address then head over to JBS. Click on Add then RSS photo feed. Paste the URL into the slot and click Test. 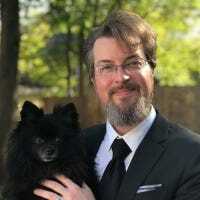 JBS will check the RSS feed and report back on whether or not the feed was valid and, if so, how many images are in it. At the bottom of the main interface you can select frequency, mode, and what to do with multiple monitors. 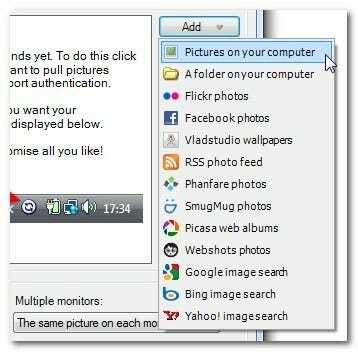 You can swap images every with a frequency ranging from every 10 seconds to every 7 days. Picture mode supports the basics (like scaling and cropping) as well as more advanced layouts like montages and picture piles. Finally, you can specify if you want a unique wallpaper on each monitor, the same on all, or one picture to span the whole desktop. While an easy to use interface and ample support for a variety of sources may seem like the obvious reasons JBS is so popular, it’s in the advance configuration settings (accessible from the More button on the main interface) that you can really see why geeks love the application. There are dozens upon dozens of tweaks that let you completely customize your wallpaper experience. While we can’t cover every setting and tweak here, we’re going to highlight a few you may find useful. Under the General tab you’ll find two useful settings. First, you can set JBS to put information about the picture in the upper right hand corner. If you’re using one of the Google/Bing/Yahoo! image search tools, especially, it’s quite handy to see where the image is coming from (as you can then go investigate the site if you would like more). Also in the General tab, the keyboard shortcuts are worth noting for those times you want to change the background without mousing over to the system tray icon. Under the Picture Sources tab, there’s a useful feature. By default, JBS doesn’t save the images it pulls from the various internet-based sources you’ve added to it. If you would like it to do so, it’s in this sub-menu you can toggle on picture saving and select a folder to dump them in. If you’re a stickler for clean and easy to read desktop icon text, you’ll love the No Draw Zones feature. It allows you to specify a space on the screen, such as a column on the left hand side of the screen, where no background will be rendered. This creates, in effect, a corral area for your icons which will always have a neutral background for good text contrast. 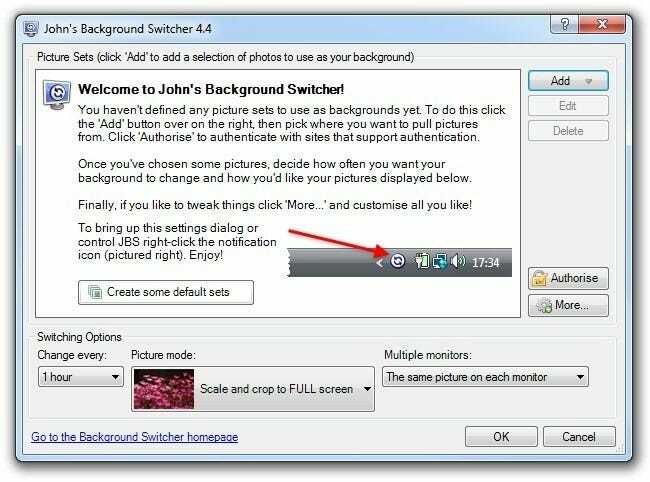 Between the abundant and easily customized sources and the abundant and easily customized settings, John’s Background Switcher is one of the most versatile Windows wallpaper management applications around. Have a cleaver JBS-centric tip or just a great wallpaper source to share? Sound off in the comments and share the wealth with your fellow readers.